PedigreeMe! 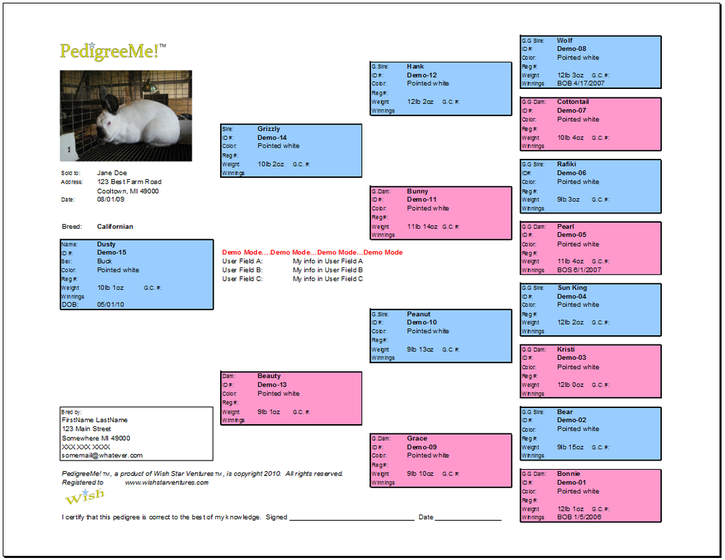 is the amazingly simple way to store and build you rabbit pedigree charts. It is ideally suited to manage your other small animal data too! Create your Rabbit pedigree charts here! Great for 4-H clubs, hobby farms and rabbitries. 1. Download the PedigreeMe! .xls file and open it in Microsoft Excel (enable macros). 2. Please try it out in FREE demo mode to verify compatibility with your computer setup. We think you will like it! 3. Pay registration fee and register. Please note: We are closed until Monday March 18 and will not be able to process new orders or send out license keys until then. 4. Enter your animal data and save your PedigreeMe! Excel file. 5. Select the animal to generate a Pedigree for. PedigreeMe! has built in help. Also, check out our Tech Support FAQ's and Knowledgebase. If you still have a question, contact us and we will generally reply within 24 hours. Please note: We are closed until Monday March 18th and will not be able to process any technical support questions until then. All minor updates within the same version are free to registered users. Just download the latest update for the version you registered and re-enter your registration information, then simply copy your animal data from the old file to the new file. Click here to see the most recent version as well as previously published versions of PedigreeMe!.